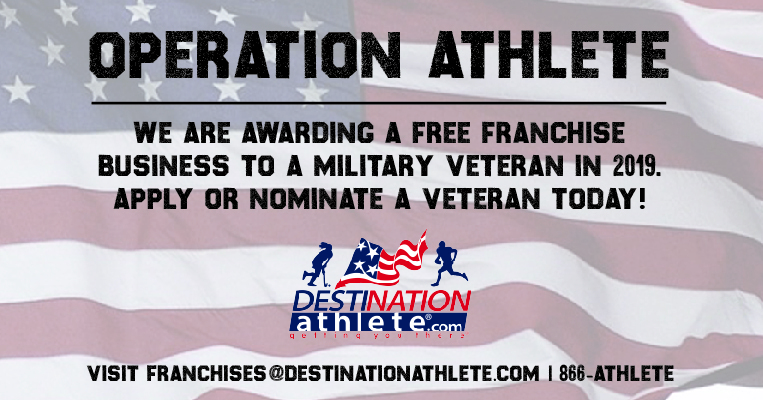 Destination Athlete® will award one franchise to a qualified veteran for Operation Athlete. Destination Athlete® will not charge a franchise fee for this awarded franchise. All other fees identified in the Franchise Disclosure Document, including royalty requirements, will apply. Qualified candidates need to submit an online inquiry form to be eligible for consideration. Operation Athlete is applicable to new applicants only. No past submissions are eligible. All applicants will be vetted and interviewed to determine if they are a good fit for Destination Athlete. Destination Athlete® reserves the right and has sole discretion to award this franchise, or alter or change this program at any time.